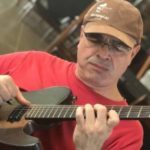 Maurice Arenas has specially created this series for Mike’s Master Classes targeting the overall player who wishes to comprehend and master many musical genres. In the first video of the series a fusion solo is broken down that contains elements of Jazz, Blues, Shred, Rock and Fusion. This first video was intended for guitarists of many skill levels from Beginning, Intermediate to the Advanced. Each level will receive something on each topic, which enables the student to continue learning more after certain concepts are internalized. Excellent lesson with a great teacher! Opens a lot of doors to the fusion style that normally seems so abstruse.